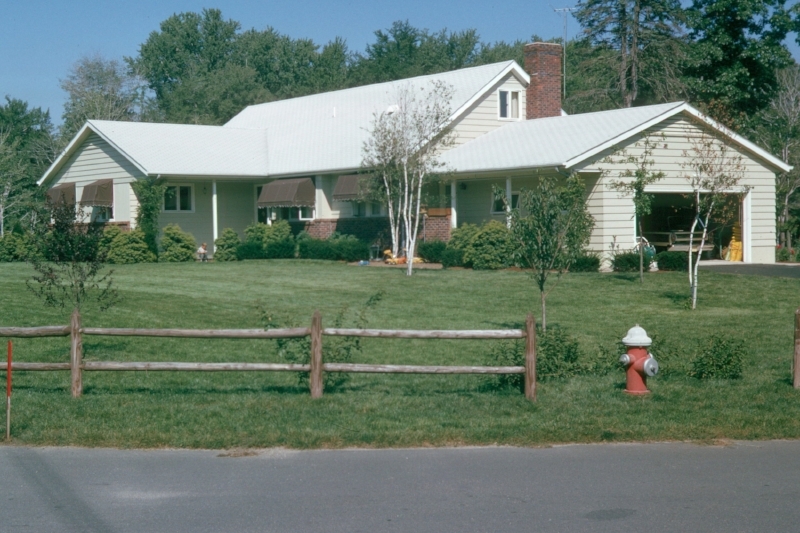 This is a photo from 1965 of the house where I grew up. That's me sitting on the front porch. My early childhood years were spent in very northeast New Jersey. My father’s work was in New York City, and rather than living in the city, he situated himself and his family in the growing suburbs on the Jersey side of New York. I wasn’t quite two years old when we moved there. Our house was in a new development on a cul-de-sac street. I don’t know what the place looked like before the houses were all built, but it must have been pretty wild. Bordering the backyard of our property was a pond that figured tremendously in much of my first explorations of nature, along with the woods on the other side of the pond. Its presence there was even something of a surprise to the developers in that it almost magically appeared when they leveled a couple of hills to do the development. The wild area that was exposed had bobcats living in it, which of course moved out when the people moved in. And my brothers and I were cautioned by our parents to avoid going past the woods because there were a lot of bats seen there. In the pond itself were lots of fish that we boys of course had to catch. Along the pond edge, if we found nooks and crannies and crevices among the rocks there, we could jam our arms deep into them and feel around to see if there were crayfish that we could grab and pull out. Plus there were lots of frogs. The bullfrogs were a loud vocal presence on warm summer nights, and there were lots of green and leopard frogs. My brothers and I were fascinated by the tadpoles. We would find them in all stages of development, from swarms of little wriggly things just hatched from masses of eggs, to nearly adult frogs that still had the tadpole tail extending back between the hind legs. And there were turtles too, mostly painted turtles but occasionally a snapping turtle. Some of the snappers were really big and so were terrifying to me as a small boy. We’d bring lots of these creatures – fish, frogs, turtles, crayfish – into the house and keep them as long as we were permitted. Based on a fascinating book about invertebrate pond life that I checked out of the school library, we even put together an aquarium with strange creatures like water boatmen, whirligig beetles, damselfly larvae, and other arthropods. We built devices to drag the pond bottom to harvest these critters for the aquarium. 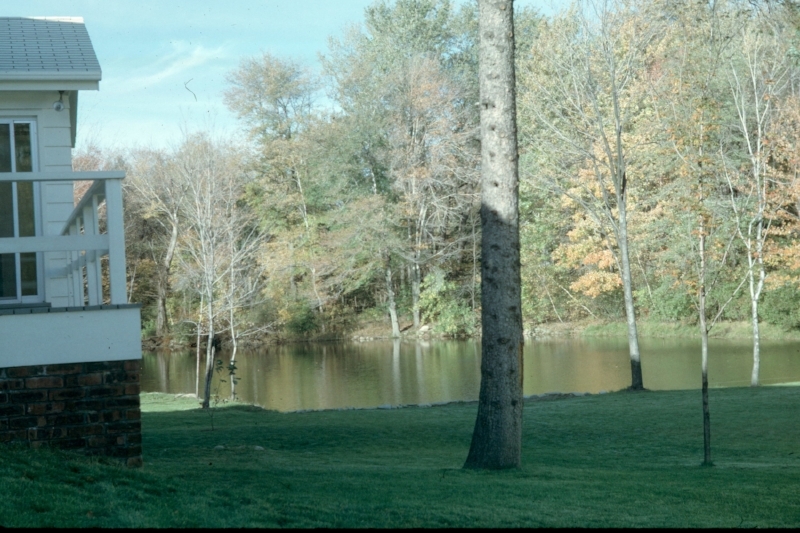 Photo of "The Pond" and our house from 1964. Birds were another thing. We couldn’t catch them, of course, but one year my older brother Joel and I were each given Chan Robbins’s Birds of North America as a present. Thus began my journey into trying to decipher what birds lived near where I lived. I remember so well the challenge of puzzling out the identities of the Green Heron and Belted Kingfisher that frequented the pond. When not out playing by the pond or in the woods, I would spend hours paging through the field guide, gazing at all the fabulous birds that were depicted in it. We also had a set of flash cards of what were supposed to be the common birds (I couldn’t imagine these being near my house), and I had a big coloring book of birds that had cool things like flickers and Wood Ducks in it. Though I could catch and hold turtles and frogs and fish, birds were more elusive, more mysterious. I was just nine years old when I saw my first Scarlet Tanager. It happened at a place my grandparents owned in rural upstate New York where my older brothers and I were sent by my parents for a couple of weeks every summer. When I saw the bird, I was by myself, away from but still in sight of the house. I remember it like it happened just yesterday. All of a sudden, this flurry of motion that catapulted past the edge of my vision was now a bird that had landed on the sandy, sparsely vegetated ground right in front of me, right smack in the open less than 10 feet away. “Scarlet Tanager!” Those two words were in my mind immediately. This bundle of red and black and beauty and grace was unmistakable! And unimaginable, too. I knew what this bird was, even though I never thought I’d actually see one. This was a bird of my dreams, one of those incredible birds that to me existed only in my copy of Birds of North America. I had a hard time imagining a Scarlet Tanager actually existing in the real world that I moved through, because at that time I thought it inconceivable for something that gorgeous to be anywhere near I place where a kid like me lived. Scarlet Tanagers and all those other crazily colorful birds depicted in my field guide seemed more like creatures you’d find in a fairy tale world of the imagination. Their “real” existence was just as paintings in my field guide. And yet there he was, in the open, right in front of me, seemingly close enough, almost, to touch. And he was looking at me! He cocked his head just slightly and looked up with that prominent black eye in the middle of his bright red head. He looked at me. I looked at him. Time froze. And then in a flash the moment was over as the tanager exploded into a red and black blur and flew away. My relationship with birds grew from there. It was a slow, steady, almost inexorable growth. Certainly not rushed. My first real tutelage was from my oldest brother’s high school biology teacher, Mr. Cantor, who led regularly scheduled bird walks around the school on spring mornings and who had a trunk full of old binoculars that someone like me could borrow. Eventually, I got my own first pair of binoculars. And then with a driver's license, my birding haunts expanded beyond where I could walk or bike to from my house. Forays to the Great Swamp National Wildlife Refuge in New Jersey introduced me to the exhilaration that comes from seeing warblers dripping from the trees in spring migration. And though in my late college years and during graduate school I discovered a bird watching club and the accelerated learning that comes from having a birding mentor, most of my birding remained a solitary venture. Being out in nature and among the birds was soul soothing, restorative, peaceful. It was where I felt connected. 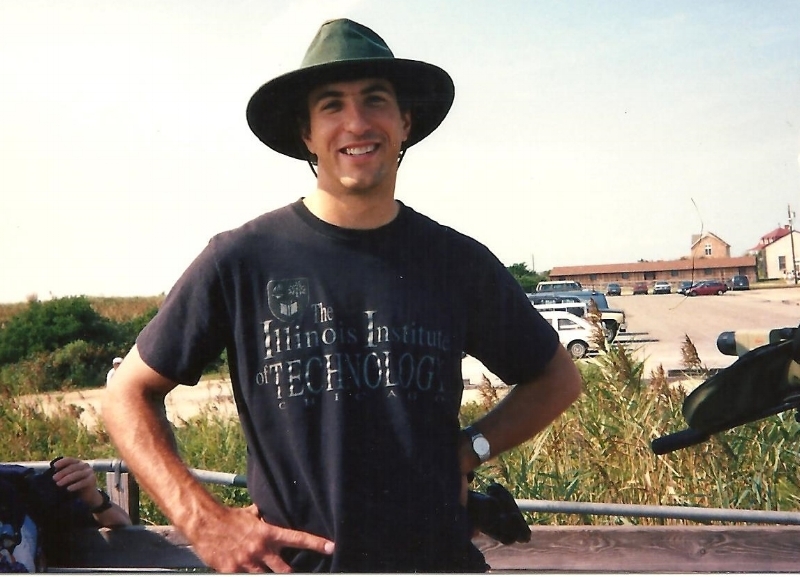 Birding in Illinois in the 1990's. When I moved to Chicago nearly 30 years ago, I was both excited and nervous. Excited because I was going to be living in a fabulous and dynamic city filled with world class cultural institutions, great music, and the full set of professional sports teams. Over time I had developed lots of interests aside from birds, and Chicago promised to be a great place to indulge these. In the suburbs where I grew up, New York was nearby and amazing and stimulating, but always felt to me to be out of reach because it was a day trip to get there. As I grew older and visited friends who lived in cities, I loved how it felt to get up and walk out the door and be right in the middle of urban activity with no effort or travel necessary. But I was very nervous to be living in a city myself because connecting to nature had always been so critical to my happiness. I wondered how it was going to be possible to feed that core part of my being. In my childhood it was the pond and woods behind the house that fed this. In the several other places I lived after that, I always had birds in the backyard and paths through woods that I could walk to from my front door. During graduate school in the years before my arrival in Chicago, I maintained sanity while writing my thesis by getting outside and looking at birds. But all these places were suburbs or small towns with nature close by. Not cities. Was I giving up nature by moving to Chicago? Little did I know that the apartment I moved into was only about a mile from one of best places in the Midwest to witness the spectacle of our continent's bird migration: Montrose Point in Chicago's Lincoln Park. This site of only about a hundred acres in size has hosted more than 340 different kinds of birds, and during the spring and fall it can be just dynamite for birding. At the same time, out on the Point there are places where visually it doesn't feel like you are in the nation's third largest city. (It is true, though, that day or night, if you listen at Montrose Point, you'll always hear the hum of nearby Lake Shore Drive!) Moving to Chicago didn’t end my relationship with birds, it enhanced it! Working my standard survey route at Montrose Point. Montrose Point, and more broadly Lincoln Park, makes an excellent local birding patch - a spot to visit regularly where the annual cycles and seasonal rhythms of birds unfold. Chicago is well positioned for witnessing bird migration. It’s situated in the Mississippi Flyway, one of the major pathways for birds moving north and south on the continent. The presence of Lake Michigan - which influences so much about Chicago - concentrates migrant land birds that don’t want to be over water. And the urban landscape makes the available green space that much more sought out by the birds. The phenomenon of migration is so tangible in the city’s parks. As I documented my sightings in the city over the years, keeping track of where and when I saw how many of each species, I became something of a "status and distribution" junkie. In spring time you look for those first-to-arrive individuals for each kind of bird. Are they early compared to recent years? late? More and more we see them arrive earlier in spring and depart later in fall, consistent with what you'd expect from global warming. The volume of birds that show up in the city parks is so big that the city birder gets more than his or her fair share of early arriving and late departing birds, and also rare birds that show up unexpectedly. Montrose Point became my main birding haunt for this reason. Fishhook Pier at Montrose Point, preparing to do a dawn lake watch. Photograph by Rob Curtis. Me in having a chat with my grandparents' chocolate Dalmatian, Nipper. During the first five years of my life, most of my time was spent at my Dad’s auto body shop - ultimately living in the upstairs office. It was located in one of the poorest neighborhoods in Cincinnati, but there were tons of kids. He was a master restorer of rare and classic European “Motorcars”, with an added specialty in Corvettes. I remember learning the exotic names on the large shields hanging over each car bay with the emblems my Mom had hand painted. The smells of my early childhood were Bondo, fiberglass and mechanic's hand cleaner goop. The only “wildlife” I can remember were the puppies our black German Shepherd, Lipshin, kept having - thanks to the neighbor's prolific Labrador, Thor. The only nature I remember was the huge oak tree my friends and I would climb next to a utility company. I loved that tree. Visiting Easter male peacock in my grandparents' courtyard. My Mom and I went to live on her friend's houseboat the summer before Kindergarten started (bare feet + wooden docks = epic summer of splinters…but also my first memory of Mallards). As my parents divorced, we moved into my grandparents' house a few weeks before the school year started (and where I lived up until college). To say I experienced a kind shell-shock would be an understatement. They lived on 5 acres in a quiet village with endless greenbelt and green space, close to numerous hiking and horseback riding trails. The pasture next to us was filled with Black Angus cattle; there were also horses and eventually sheep (guarded by a big, sweet Great Pyrenees). There was all kinds of wildlife like deer, raccoons, opossum, fox, snakes and wolf spiders (which to my teachers’ horror, I would take to “show and tell” in a jar). But there were no kids around, so a lot of my time was spent hanging out in our next door neighbors stables where they had horses, cats and bunnies. One of my favorite bird memories was sitting on the back terrace with my Pop Pop. He had a pair of binoculars and his Birds of Ohio book. Pop Pop said, “Hear that? That’s a bobwhite, it says its name.” Nana made sure the hummingbird feeders were filled with sugar water and Pop Pop made sure that all the feeders in the courtyard were full, so there were lots of “backyard” birds. There was even one Easter morning when my grandfather woke me to tell me we had “special visitors”...a male and two female peacocks! They escaped from a nearby farm...thankfully it took 2 days to figure out where they came from! Best. Easter. Ever! Crow. 1997 Aaron Arendt (given to me after a painting class critique. I adore it everyday!). I attended The Art Academy of Cincinnati, which at the time was connected to the Cincinnati Art Museum in Mt. Adams. On the neighboring hillside there was a communal crow roost of about 20,000 crows. After college, I moved into a 500 sq.ft. studio adjacent to the art museum that had a 9’ x 9’ window (“in” the roost) which overlooked the city as well as the neighborhood of Over-the-Rhine. I definitely had company...in the form of thousands of tiny Crow eyeballs. It was one of the most incredible experiences because I would for years prior see them, while in school or coming home from work, flying in flocks from all directions of the “seven hills” - making their way to their roost...which I now shared with them. They are so intelligent, mysterious and beautiful - it was an honor to share the hillside with them. Since graduating from art school, it was always my dream to live in Chicago. In 2006 my husband Geoff (who’s an architect) and I moved to this great city of architecture by the great lake, where I went back to school to study interior design. In school, we were given an assignment to design a Flatpak house. I had recently seen a documentary on PBS about Bowerbirds, the (slightly OCD) artist and architect of the bird world. It absolutely blew my mind how they would collect different types of objects in the same hue of a color, then arrange them in a very particularly way. They would also build beautifully complex structures to display their creations - all for attracting a mate! I decided to base my concept for a lake house design on these fascinating birds; designing interior structural core elements out of reclaimed ash-wood while defining adjacent spaces with color. This was my first bird inspired project. I’m someone who got interested in "birding" in a very backwards way – via a sick squirrel that I called a wildlife rehabilitation center about. Unfortunately, it took a day to hear back from them and the squirrel had already died of suspected rat poisoning. I followed their instructions of “body removal” to ensure that no coyotes or crows were then poisoned to death by eating its carcass. They were understaffed and needed volunteers - especially in the Migratory Bird Rescue and Salvage program. I said, “Yes.” - but had really no idea about what was happening. I learned that Chicago is one of the top bird strike cities in the U.S., but not without the efforts of bird rescue and salvage programs in addition to a “Lights Out” program of the city’s skyscrapers during peak spring and fall migration. The numbers of deaths are less than they were, but still annually – according to the National Audubon Society – hundreds of millions of birds are killed from building strikes each year. That doesn’t include deaths from invasive species like cats, wind turbines, pesticides, global warming or natural disasters like storms and droughts. These birds come from as far away as South America to breed in North America, primarily the boreal forests of Canada. Some of these birds also breed in Chicago. They endure this long treacherous journey each spring and fall to breed, to ensure the survival of their species. That first morning out on rescue changed my life. There were mostly different species of warblers lying dead at the base of buildings (which the rescue salvaged and would take to the Field Museum to be studied by their bird department). Black-and-white, Magnolia, Tennessee, Blackpoll, Cape May, Nashville...so many colors and patterns I’d never seen before on wild birds! I have a bit of an obsession with patterns, ironically, initially with capturing images of building facades - the very thing these beautiful birds were striking. I had never seen this kind of death toll before. Viewing these motionless birds in my hand made me appreciate them as colorful, abstract, (living) works of art – weighing as little as a piece of paper, yet traveling thousands of miles to survive. Amazing. I learned why these beautiful little warblers are considered “the butterflies of the bird world.” Simultaneously, there were also many people walking like zombies staring into their phones. One woman, looking at her phone, was about to walk on top of a dead Magnolia Warbler. I got her attention and told her that I needed to collect it to be studied (preferably not squished). She had no idea that she was about to crush it. With a sad face, she said “What a beautiful little bird.” There was also a man looking at his phone that almost stepped on a living, but stunned, Nashville Warbler in need of treatment. All I could think was that this is how disconnected and distracted we’ve become. I began to understand, in a tangible way, that these small creatures are all part of this bigger picture...that we are connected to. Over 300 species of birds are migrating through Chicago…ultimately thousands of birds twice a year. We are connected to this extraordinary journey. Chicago is one of largest cities in the country, but we are also a wild city – we have coyotes! I remember my Nana giving me a Snowy Owl stuffed animal when I was 9. I loved it so much it inspired a book report for one of my 4th grade classes. I remember writing about it being an Arctic bird - thinking it was a bird that would be impossible for me to ever see. Never in my wildest dreams could I have imagined that they would winter close to where I live. They’ve wintered in Chicago consistently the past few winters because of a phenomenon known as an irruption! On that first day out, my trainer and I rescued an immature male Northern Parula. The wildlife rehabilitation director texted me the picture of the same bird before he was released, after receiving treatment. He was hopefully going to be able to continue to not only survive, but to breed. This experience ultimately inspired me to create work that explores their beauty, color and patterns in an intimate and unexpected way. I don't own a car, so when I wanted to start officially “birding,” I began going to Montrose Point Bird Sanctuary. At the time, I had no idea how lucky I was to be in walking distance to one of the best places to bird in the city, let alone in Illinois. I began looking at eBird to figure out what birds were what, based on what birders were documenting earlier that day. I got a birding monocular…which was all wrong. A “serious birder” asked if I was "going to the opera" (ironically). It was not only extremely isolating being a lone birder, but also incredibly frustrating not knowing what I was seeing/hearing. On page 7 of Sibley’s Birding Basics, Sibley acknowledges this and discusses how important birding with experienced birders is...but not how difficult it can be for women to find mentors…so I began my search. One morning in Montrose Harbor, I saw a large waterbird with a striking black head, stunning white-streaked “necklace,” dagger-like beak and beautiful white feather patterning that had me stalking it for an hour trying to figure out what it was. It was a Common Loon in breeding plumage. It was so exhilarating to see this bird I’d never seen before in the wild - a “lifer”. This is the piece inspired from that day - that would motivate future work. They all have a story. I’m always curious to know where they’ve been and where they're going and am so grateful to be a part of their journey. Together, The Nerd and the Bird get to be a part of that journey too.